Do you fancy yourself an avid gardener? Are you looking to transform you garden with wonderful soft landscaping features? 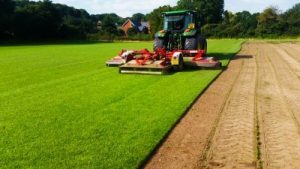 At Abbey Turf, we are one of the best top soil suppliers Southampton has seen as we supply a high-quality top soil product that is sure to deliver unbeatable results. The perfect garden is closer than you think courtesy of Abbey Turf as we rank among the leading Southampton top soil suppliers around. With both the town centre and Southampton Common packed with tourists, you need a space that is just for you and we can help by creating a sunny little escape for you to enjoy. A beautifully cultivated garden is the perfect place to relax, spend time with the family or partake in a summer barbeque. For the most attractive looking lawns, garden borders and plant beds it is worth purchasing premium products such as the one supplied by Abbey Turf. What sets us apart from other top soil suppliers in Southampton is our keen eye for detail. We actively screen our top soil to ensure that there are no foreign objects such as sharps, debris or weeds. New build properties often have poor quality soil due to the top soil being stripped away during the build phase. By introducing a high-quality top soil, you will create a nutrient rich environment which allows for greater water and gas retention. This, in turn, will lead to stronger, healthier plants. Our Southampton suppliers provide top soil that comes in a variety of grades, and we can recommend one that is appropriate to your needs. As the finest top soil suppliers Southampton has experienced, we will ensure a prompt delivery at a time that is convenient for you. We use specialist maxi bags to ensure an efficient delivery free of spillage. Should you require it, our skilled team can arrange to have the bags lifted over your fences and walls. But that’s not all, on top of being Southampton’s best top soil suppliers we also provide exceptional landscaping services upon request. We can help you to create breathtaking vistas with a professional design service that is tailored to you. Our team make use of the same top soil that we supply to help you get the best results out of your garden. At Abbey Turf, we pride ourselves on the reputation we have established and the 25 years’ of experience that we have to offer. As far as Southampton top soil suppliers go, none are as knowledgeable as our expert team. Each has been trained to a high standard and possess a broad range of skills and expertise. Take a look at our top soil gallery to see how our suppliers in Southampton can help transform your outdoor space. Get in contact with the most reputable top soil suppliers Southampton has to offer. Call Abbey Turf today on 02380 812302 to find out more from our team.